We spent most of the weekend on the boat, but we didn’t get any sailing in. We had a few odds and ends that we wanted to address and wound up doing quite a bit of maintenance…and apparently broke some things in the process. One of the first things that I wanted to tackle was our anchor. Get it? Tackle? Anchors are part of your ground tackle? It’s been a long day. Our new boat came with two Danforth-style anchors. Danforths are a popular choice around here, and we used ours successfully when we anchored at Sandy Hook during our delivery, but we’ve had mixed results with them in the past. While they have an incredible holding power-to-weight ratio, they don’t reset themselves in switching currents and they can be finicky to set at times. Our anchoring lives were forever changed when we got a modern “next gen” anchor for our 22, which always sets with conviction and will reset itself if we get spun around with changing winds or current. We’d need a much larger one for the new boat though, and since the prices seem to go up exponentially with weight, I wanted to have some reasonable assurance that it would fit in our anchor locker before breaking out my already tired debit card. Of course, they only give you a handful of dimensions and it’s a silly shape. But it’s good to have sailing friends…especially ones who are engineers and know the hell out of CAD. I gave a line drawing of the anchor we wanted to Mr. Bubs, and he was able to turn it into a 3D model and scale it to the published dimensions. 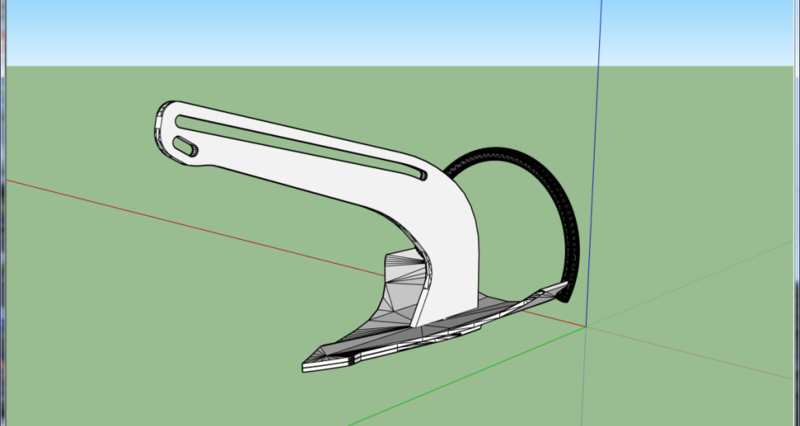 I was then able to use the CAD drawing to measure the rest of it, so that I could build a mockup. It’s not perfect, but the exterior dimensions are correct. Thanks Mr. Bubs! It fit. Jen and I discussed whether we should leave it out and try to convince passersby that we were going to use it as an actual anchor, but as evidenced by the photo, we didn’t get to it until the shadows were already pretty long. We spent most of the day dealing with other issues. So, there’s an inherent problem with inboard boats. You’ve got this engine, spinning happily inside your boat, and it’s connected to a rod that spins your propeller, which is notably outside your boat. This requires that there be a fairly substantial hole in your hull for the propeller shaft to go through, and a hole below the waterline tends to want to let all of the float out. In order to get around this, there’s a piece of nautical arcana called a “stuffing box,” which is, ironically, not a box. It’s a piece of hose connected to a large bronze nut that’s filled with waxed flax, or some modern equivalent. The nut tightens the flax around the shaft to keep out almost all of the water. It needs to let a few drops of water through while the shaft is turning to keep everything cool, or the flax can get weird and score the shaft. Finding this balance by counting the DPM (drips per minute) is up to you, new boat owner. According to respected boat guru Don Casey, a stuffing box should leak approximately zero DPM at rest and 2-3 DPM while the shaft is turning. Mine was running around 6 DPM stopped and it’s apparently a Wham-O Fun Fountain at hull speed, so I needed to adjust it. The problem is that the only way to get to the stuffing box is through an access hole in the quarterberth that’s not quite big enough for two arms and a head, which is a requirement for putting two wrenches in there and turning the locking nut off of the adjusting nut. Throw in the fact that the bronze on our stuffing box appears to date from the Bronze Age, and it’s like trying to open a stuck jar of jam while it’s still way up inside the jam vending machine. The other problem was that I was concerned about our batteries. I put an overnight charge on our battery bank and the #2 unit was reading a solid 10.0V. This is dead beyond dead. I decided to be prudent and replace them both. Prior to disconnecting the wires, I taped each lug’s worth of leads together and labeled them. There are a lot of leads going directly to the battery, which I don’t think would get the MaineSail Seal of Approval, but my goal was just to replace the batteries at this point, and not to rewire the boat. After toting a whole bunch of lead around the yard and connecting up the new batteries, the bilge pump automatically turned on and drained the half pint of water that had accumulated from my poorly tightened stuffing box drip. Yay! And the VHF worked! And the engine could still be started! But nothing that’s actually going through my electrical panel worked! No cabin lights. No running lights. No fan. No stereo. After spending so much quality time in the jam vending machine, I was eager to lay on the cabin sole and attempt to examine my electrical panel through the tiny port under my sink that isn’t quite big enough for my head. I was imagining the crawl across the bottom of the screen: “Boat Cut in Half to Extract Idiot Sailor’s Idiot Head.” Maybe I would have at least been able to meet Ira Glass. I could get technically get my head in there, but there was no way I could also get an arm in there, not that I even knew what I was looking for—maybe a fuse or something, but who would put one in there? After the obligatory white-hot bursts of profanity screamed through the cabinetry, Jen asked why I wasn’t using the larger-than-head sized access port under the galley. Yeah, it’s one thing to be bad at electricity, but it’s quite another to not even be able to find the electricity door. I found no immediate explanation. It was getting late, beer supplies were low, and I already had an access port-shaped bruise developing around my entire upper torso from trying to worm into areas where I clearly didn’t fit. We’ll have to chalk this one up to “to be continued” as well. I have no idea. Jen did do a lot of cleaning while I was breaking things. That was good. Val fixed our sail cover, and it looks great…better than new (it’s good to have sailing friends). The rest will come. I just feel like I’m starting over in a lot of ways with all of these bigger boat systems. I feel for you. We’re on our second year with a bigger boat with an inboard (S2 7.9, similar in size to your Catalina 27). The inboard ran pretty well all last year, but I’m having all sorts of trouble with (what I’m assuming are) air leaks causing it to stall out randomly this year. Running around to all of the farm supply and auto parts stores trying to cobble together all of the hoses and fittings needed to replace the fuel lines and seals for a couple of days is FUN, right?? Hopefully I’ll have all of the stuff tonight and can get it fixed (and that that IS what is wrong…). Silly people and their silly boats, am I right? Yeah man, it's always something. I do love 'em, but it's also a relief to complain sometimes. Best of luck with your engine issues. I don't even know what I don't know with that stuff yet. We're still in the very early days of figuring this all out. Thanks for checking out our boat log! May your volt meter read well into the upper 12s. Resist the pun . . . always resist the pun! I included a disclaimer. All's fair in war and disclaimed text, counselor.